I taught my first class last night!!! It was nerve-wracking and exhilarating all at once! I’m pretty good at doing some things, but teaching those things to others doesn’t come easy for me. I tend to get a little tongue-tied and talk with my hands…a lot!!! Anyhooooo…nobody cried, died, or wound up on the FBI’s 10 Most Wanted List, so it must have gone okay! 😉 The ladies in this class are super sharp and eager to share as well as learn…the perfect combination! 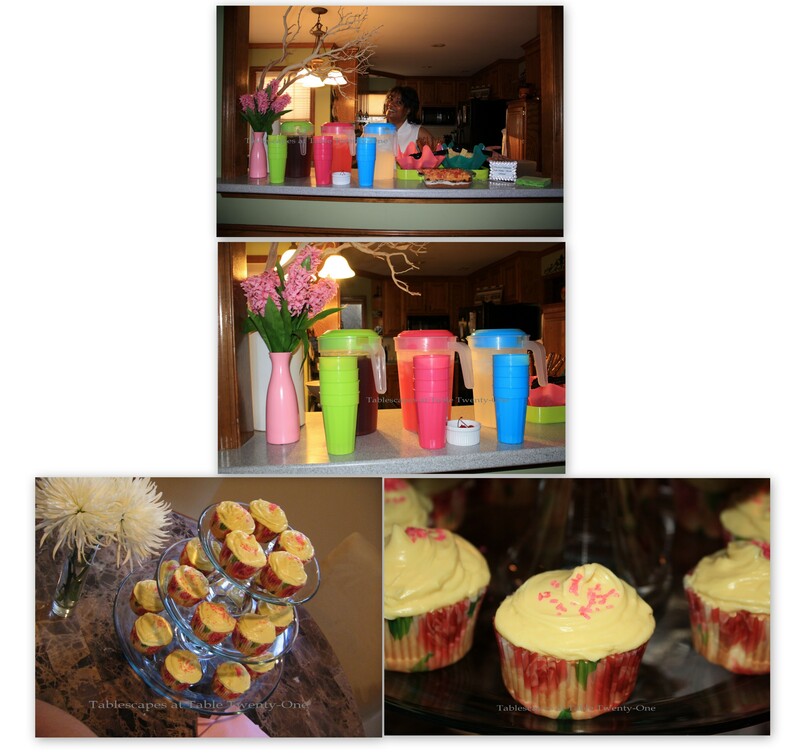 This first series of classes focuses on buffet tables specifically geared toward springtime events. The college granted permission for me to hold the classes in our home (which makes it so much easier and so much more comfortable for everyone! ), and I constructed several tables throughout the main floor and lower level. I’ll share one in this post and the others in the coming weeks. This first one is a casual Easter buffet brunch that could be easily augmented depending on the number of guests you have to serve. If you’re lucky enough to have great weather around Easter time, consider setting something like this up outdoors! I chose a floor-length ivory tablecloth topped with a gorgeous pastel-on-champagne silk topper that I made myself. Easter egg-colored floral vines wind their way up and down the fabric, lending a whimsical feel to what might otherwise be perceived as a bit staid. 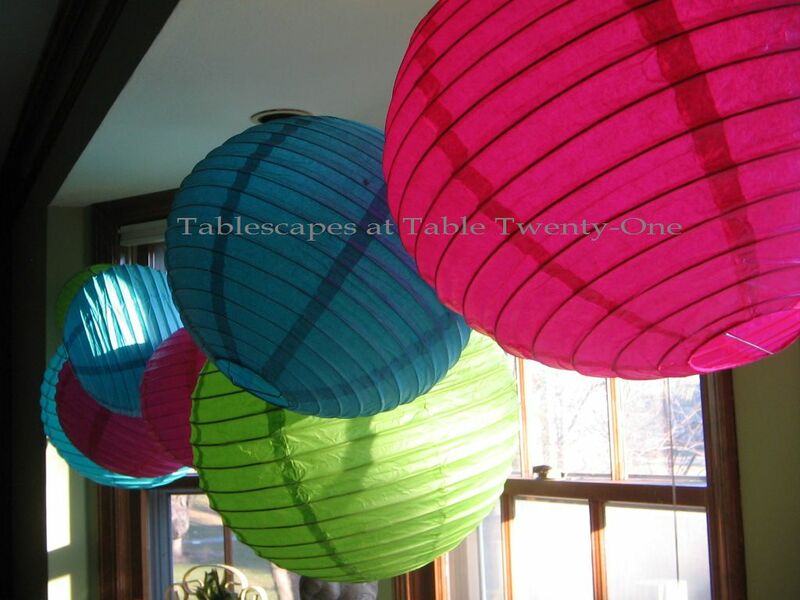 Paper lanterns in fuchsia, aqua and lime green – hung with homemade wire hooks on a length of fishing line – dance frivolously overhead, lending height, color and movement to the vignette. 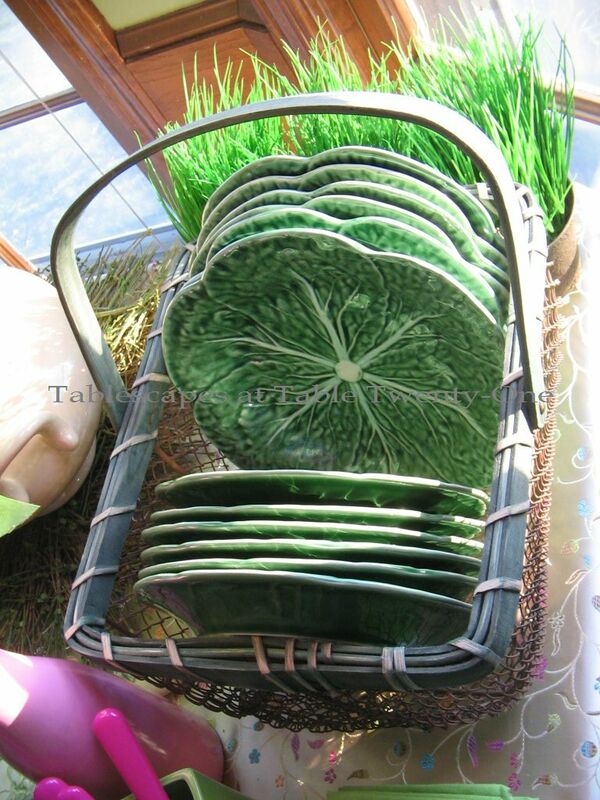 Green cabbage leaf plates by Bordallo Pinheiro are tilted on end in a casual wire & chipwood basket for a fun presentation. 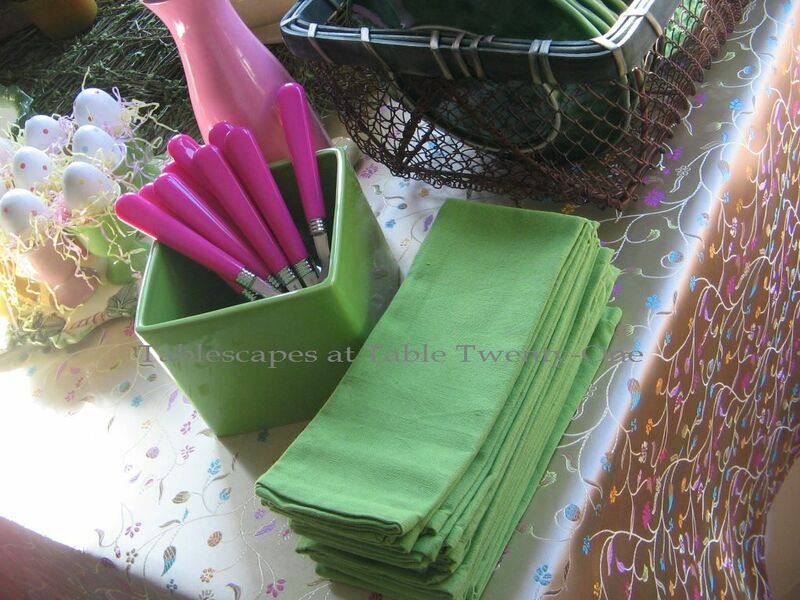 Hot pink flatware from TJ Maxx is displayed in a lime green floral container. Lime green cotton napkins from Bed Bath & Beyond are neatly stacked. The morning sunlight casts shadows across rows of polka-dotted Easter eggs displayed in pastel egg cups from Crate & Barrel. 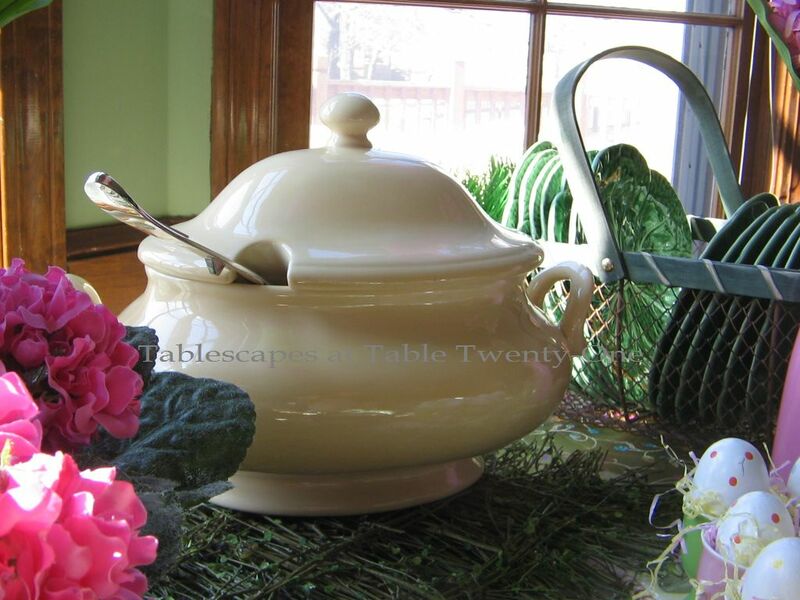 Serve scrambled egg dishes, oatmeal, or whatever you like from this soft yellow Pottery Barn soup tureen. 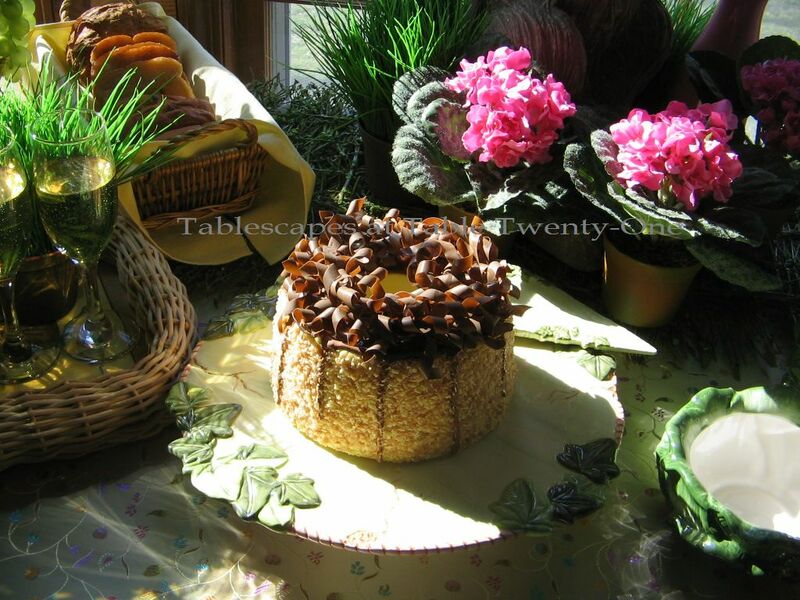 Dessert is served up on a vine-covered ceramic cake plateau from Hobby Lobby. 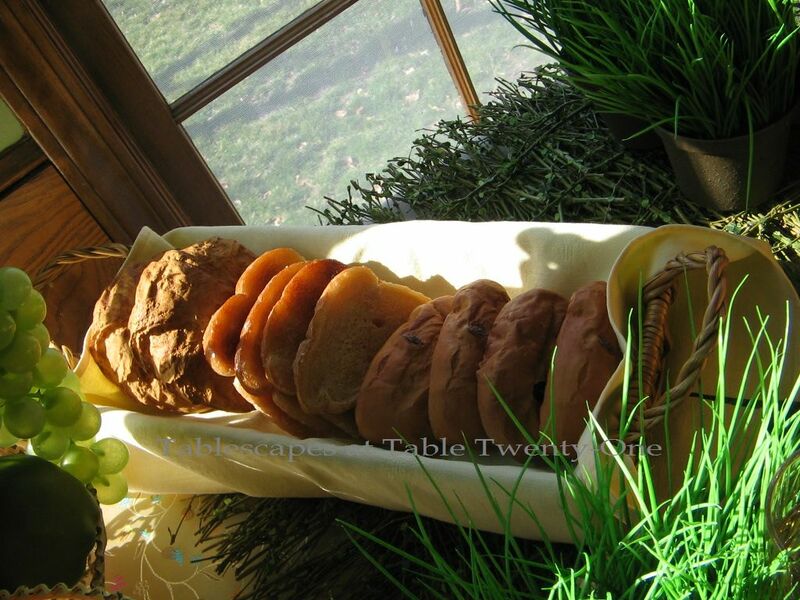 A variety of breakfast breads are presented in a linen napkin-lined wicker basket. Another wicker basket lined with ceramic tiles serves up glasses of champagne. The pots of bright green grass on the table give us hope that our lawns will soon change from the crispy, drab brown they have been for so many months. 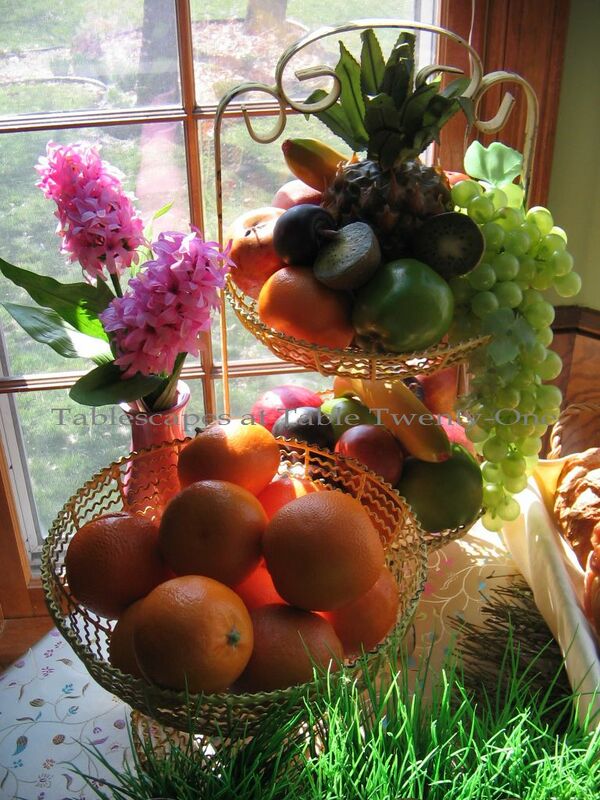 Getting your 5 daily servings of fresh fruits & veggies as recommended by the FDA is easy when they are displayed in pretty shabby chic wrought iron baskets like these. A vase of pouty pink hyacinth peeks out from behind. 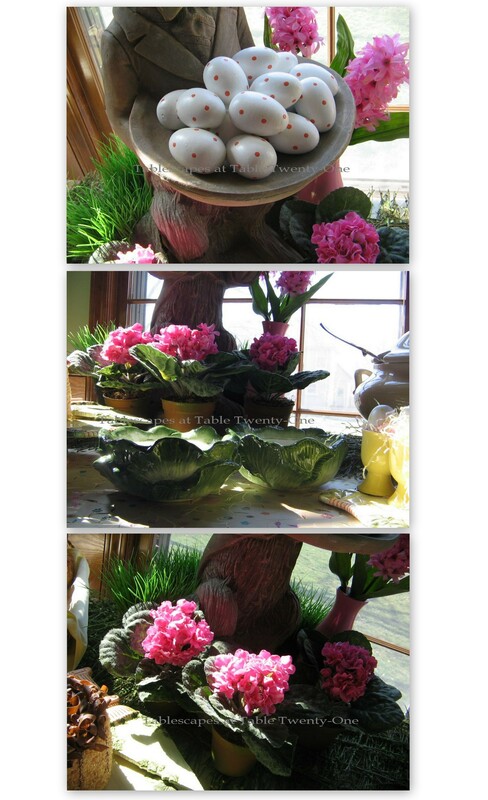 More polka-dotted eggs fill Barton’s bowl while a trio of pink African violets surround his big bunny feet. Green cabbage bowls from Tuesday Morning are ready to serve up sauces or garnishes. Yes, I know: it’s a class not a coffee klatch. But I still wanted to serve my students a little something-something to nosh on. A tiny buffet of real food including a homemade 7-layer dip, snack chips, lemon zest cupcakes, and icy cold beverages is set up on the breakfast bar. 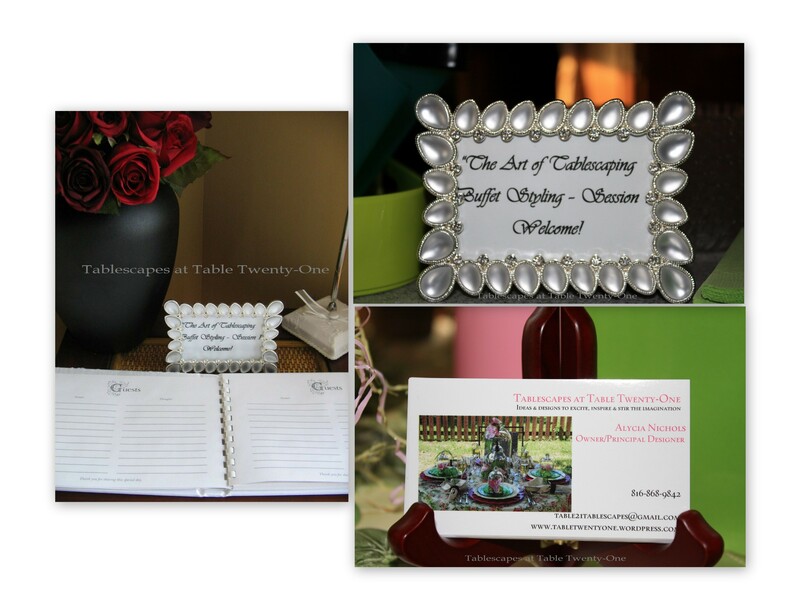 Don’t forget to join me as I visit other tablescapers from around this great planet of ours on Tablescape Thursday! And this week, I’m also hooking up with the Style Sisters for Centerpiece Wednesday! High five, fist bump, dap, and big hugs. Everything is gorgeous and I am so happy for you. Looking forward to the rest of.the series. I wish I could have been there — I am sure you had them eating out of your hand. The table is so pretty and I am so ready for the crazy weather to decide if it is Spring or still winter! You do such a good job of decorating a table! I love the flower pots below the rabbit and the various ways you displayed the food items! That grass makes it all so perfect! Dang I going to have to steal a lot of ideas from you! 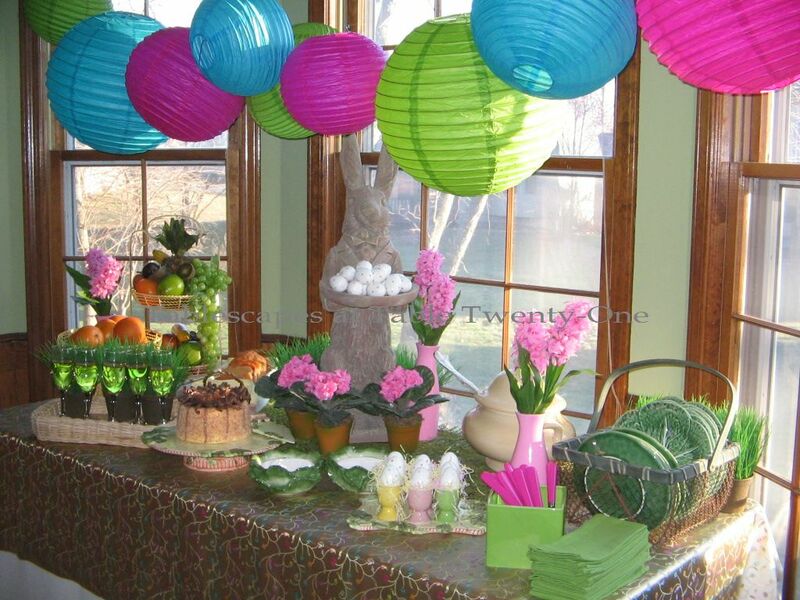 Those paper lanterns above are such a cute idea- love all that color- it makes it so festive and cheerful! Did you grow the grass yourself? That really impressed me! Congratulations again on the class!! So neat that you’re teaching a class in tablescaping. Love the buffet. That bunny sculpture sets the mood. I wish so much I could attend your class! You gave them great ideas in just this one buffet table. Easter is a tricky one to do trying to keep it pretty and tasteful. The stores are full of plastic and tacky glitter (stay away!). And on top of all that, you fed your students too? Can’t wait to see the rest and thanks so much for sharing with the rest of us! and I’m running out of ideas! November. You’ll be hearing from me! Such a pretty table. How did you get to teach tablescaping? Your table has inspired me for a baby shower I am doing in June. Great job. When I grow up, I wanna be just like you! I love this buffet. You always amaze me with each and every little detail… the beautiful pink flowers on the table that match the pink lanterns…the little pots of grass to accent the table….you are just amazing. I so wish we were visiting Mom soon, cause I think I would have to find a way to make it to one of those classes. How fun would that be! I would totally drive 3 hours to sneak in on a class! I know you’ll do great…and all of that talent those ladies are getting to soak up. I’m totally jealous! Have a great weekend! Hopefully some sunshine will come your way! Yahoo, one class down. I thought of you and wished I could have been right there sharing in what I know was a very fun time. You have so much to offer with your cleverness and humor, what I love about you. 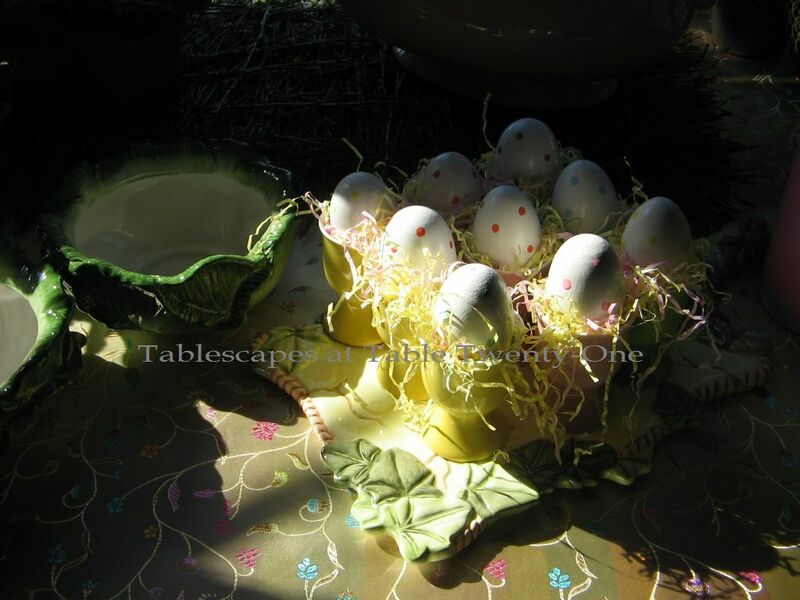 As always, your table is just right and I can’t believe you are already to Easter which will be here in a flash. Where does the time go? Hugs. You know, I’ve seen quite a bit of those lanterns around lately. I almost got one the other day. Problem is, I need “a bunch” to make it work. Well, I guess I’m just going to have to buy lots of them. My “tablescape teacher” told me to. Wow! !, oh wOw this is amazing! How fun that you are teaching a class and sharing all this goodness with so many! I am dying for your big bunny, really I am dying for everything in this tablescape including all the yummy food! 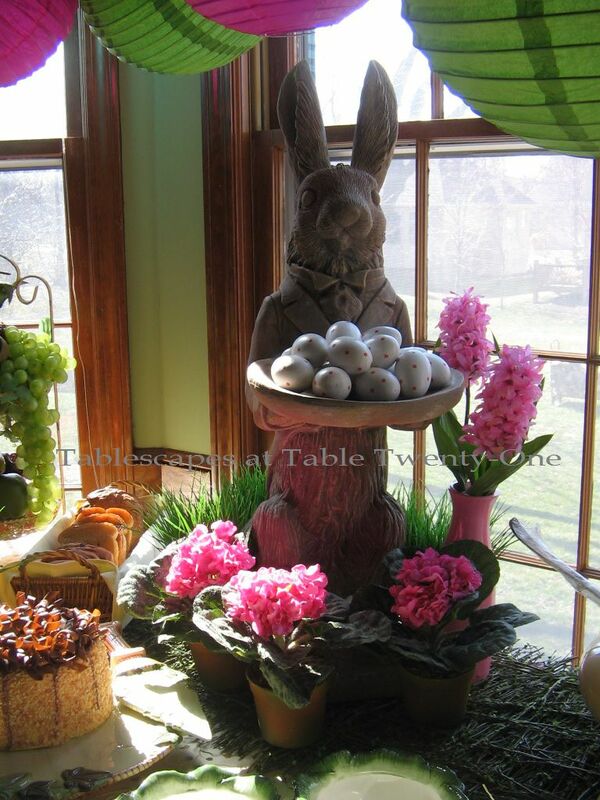 Come link up that big bunny rabbit on my centerpiece Wednesday party! Hey, Karin! I bought that bunny about 10 years ago when I had my fine rentals business. When I sold the inventory, he was one thing I simply couldn’t bear to part with, so he came home with me. The company I bought him from has since gone out of business, so I hope nothing ever happens to him! I hooked up to Centerpiece Wednesday. In fact, I linked up 2. One is from a fundraiser I did last weekend. Pretty! Love the way you placed the plates in the basket. Hope you’ll stop by my site and check out the details of the new blog party I’ll be hosting on Mondays! No fair…I would LOVE to come to your class! Beautiful, springy table, Alycia! As always, you hit it out of the park! Well done! If it wasn’t for the ten hour commute each way, I’d be right there standing in awe, and soaking up your tips and tricks! You always add just the right drama which put your tables over the top. I used my hand to cover the paper lanterns, and your buffet is beautiful, but the lanterns make it extraordinary! LOVE the polka dot eggs, and the dishes are so pretty. Looking forward to what’s next!!! LOVE the color combo! I also like the hanging lanterns. Your buffet is just beautiful!! I’m sure you will become more at ease with your class as each week progresses. Oh my goodness! Wish I could take your class; you are so creative and talented. I’m sure your students will enjoy every one of those classes. What a great Easter table. I think you should do a book and with lots of photos for those of us that can’t attend your classes. I love that YOU were nervious! lol You are so talented, gifted, dramatic and an extremely beautiful person. I can’t imagine they didn’t fall in love with you! I would love to be in your class. I love everything you used! I love the lanterns to match…great idea! Everything just blends with a punch! Relax until the next class! Your tables are always beautiful! Oh my goodness! I can think of no one better to teach such a class! I wish I were closer so that I could attend! I love every little detail on your buffet. The lanterns are just pure genius and I would expect nothing less from you. I am looking forward to seeing the rest of the lessons/ tables! Just wanted to let you know…. I published this post on my facebook page. I love your ideas! How fun to teach a class in tablescaping! I took a class years ago and it was so fun. I am sure the students will love you and the tables. Oh Alyshia, how much do I wish I could become one of your ‘students’!! Do these ladies know how lucky they are???? Just beautiful, as usual. WOW! That looks fabulous! It must have taken forever to do all that. No detail left out. The colors are wonderful, and I love how you have arranged everything. I am sure your class was great, what a treat for them! The rabbit have his own room? What a great focal point. You are certainly the expert! Congratulations, on your new teaching adventure! Those are some lucky ladies. I really love your buffet. What is especially catching my eye is the way you have varied the heights of everything. I am also really paying attention to the variety of textures you have. Your students aren’t the only one that are learning from you ;-). Oh my goodness….Alycia, these gals had to be in 7th Heaven!! You really went all out & I LOVE every inch of it!!! I ADORE that big bunny & I want one. Waaaaa! Actually, I want one of EVERYTHING! You have so many wonderful things to play with & the neat way of displaying the dishes & also lining up the breads…Brilliant! Those colorful lanterns just scream PARTAAAAYYY! Fun, Fun, Fun!!! I may have to “benchmark” all these ideas for Ms. C’s birthday this year. She would go bonkers for all that pink & green. Her Mommy was a Delta Zeta & they LUV pink & green. Gosh, I sure wish I could have been there to see it all in person. Oh how fun! I bet your class is amazed at your Easter creation……of course, by now we all know to expect the absolute amazing everytime you post. Love the plates…..big bunny…….polka dotted eggs……well, EVERYTHING! Please take me into your classes Im sure all your studnets are having fun and learning to. The table and bunny looks great. Alycia, you say your not crafty but you are have GREAT talent. Great work. I just continue to see more and more beautiful tablescapes on your site.. Each one has my eyes just popping with excitement. I love the pops of color on this setting..everything looks so magical and fairytail-ish. I love it.. HIGH FIVE Slap on this one! !